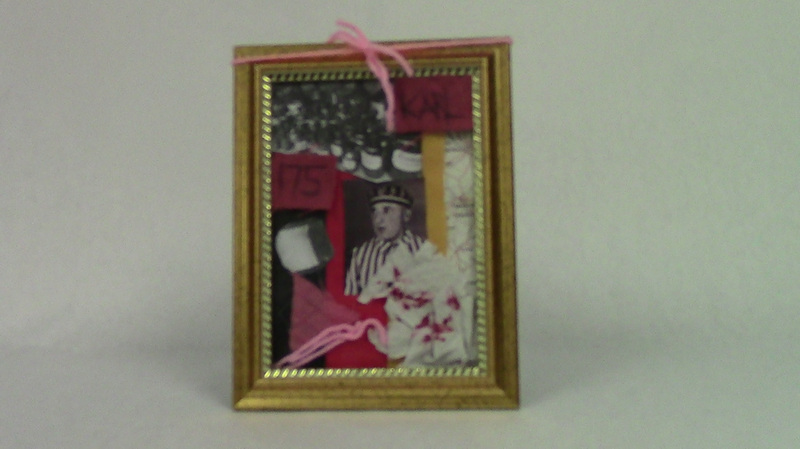 My shadowbox is for the Holocaust survivor Karl Gorath. I used a lot of symbolism with pink colors. I did this because he was a homosexual prisoner in the Holocaust. Homosexual prisoners were given pink triangles to wear on their shirt to identify themselves. I represented this through pink string and fabric. I also used a dirty bloody rag to signify that he was a nurse while in the concentration camp. I also represented this through a picture of medicine bottles. I included a picture of bread because of an interesting story that occurred during his time in the Holocaust. He was ordered to give less food to the Polish prisoners in his camp, however he refused because he believed it to be inhumane. As a punishment for this he was sent to Auschwitz. I also included a map and flag of Germany to show where he was born. Karl looked back at his hometown of Bad Zwishenahn as the cattle car screeched down the tracks. He had been thrown into the car with many others by members of the Nazi party. How had someone found out? Karl could only think of one thing. He had spread his secret. His jealous lover had revealed Karl. According to the Nazi party, being homosexual was a crime. He looked around the cattle car at the others who had also been captured. Dozens of solemn, silent faces stared back at him. A two hour journey followed. It felt like decades. He arrived at some sort of encampment called Neuengamme. He was 26. Karl had an interesting life before he was captured by the Nazis. He was born in 1912 in the small German town of Bad Zwishenahn. His father was a sailor, and his mother became a nurse in a local hospital. After his father died he lived with his mother. He trained to be a deacon at his parish church. He was taken to the concentration camp Neuengamme in 1933. He was brought there with many other groups the Nazis did not like. These included Jews, Gypsies, Jehovah's Witnesses and more. There he was forced to wear a pink triangle to identify him as homosexual. He was a part of a group called the “175ers” who were all homosexuals living in Neuengamme. They were called this due to the fact that homosexuality violated paragraph 175 of the criminal code. Nearly seven years later, in 1940 he was transferred to work at a Wittenburg subcamp. He worked in a prisoner hospital because he had had some experience as a nurse. There he treated prisoners who had injured themselves or had disease. Dysentery was a very common sickness that Karl had to treat. This sickness ran so rampant because of the horrible food that was served to the prisoners of the camp. Diseases could also make their way quickly through the camp for many reasons. The living conditions were very close quarters and unsanitary. People were not clean and often slept cramped together. One day a guard ordered him to lessen the bread ration given to Polish war prisoners. He refused to do this because to him it was inhuman. As a punishment for this, he was transferred to Auschwitz. There he wore a red triangle instead of pink. This was to mark him as a political prisoner. While in Auschwitz he had a lover named Zbigniew who was Polish. In 1945, he was liberated from Auschwitz. Due to violating paragraph 175 of the criminal code, he had a criminal record, and therefore had trouble living after the war. The Holocaust was a horrible crime that killed millions of people. Six million of these people were Jewish. However it is important to represent people who were not Jewish in the Holocaust, like Karl. Roma, Catholics, Jehovah’s Witnesses, Homosexuals and many others were also persecuted and killed under Nazi rule. Karl Gorath was very lucky to have come out alive from such a terrible experience. He was under Nazi captivity for 12 years. Many people were killed on the spot, or worked to death. Karl made it out through several lucky breaks, and the fact that he was a trained nurse. Truly Karl was an amazing man, and I am glad to honor him.